And his countenance was as lightning, and his raiment as snow. And for fear of him the guards were struck with terror, and became as dead men. The use of light and shade, saturated colors, and bold gestures dramatically capture the drama of the Resurrection, so vividly recorded in the Bible. Famous as the teacher of Rembrandt, Pieter Lastman brought a direct, emotional conviction to religious themes in his native Amsterdam in the early 1600s. In The Resurrection, Lastman emphasized the expressive power of the miracle taking place, contrasting divine light with the doom of the unredeemed. An angel gently lifts the heavy lid from the tomb as Christ ascends to heaven surrounded by putti. Bright light from Christ's halo illuminates the standing angel and throws into shadow the standing soldier with upraised arms, outlining his bright red costume. A terror-stricken soldier sprawls on the ground with his head thrown back and his arm raised as if to ward off a blow. To the right, a turbaned man shields his eyes while a soldier in a plumed hat sleeps. In the background, rays from the rising sun light the approach of the three Marys. Private Collection (Scotland), sold to Malcolm Waddingham, 1987. Malcolm Waddingham (London, England), sold to the J. Paul Getty Museum, 1987. "Acquisitions/1987." The J. Paul Getty Museum Journal 16 (1988), pp. 156-57, no. 21. Williams, Julia Lloyd, ed. Dutch Art and Scotland: A Reflection of Taste, exh. cat. (Edinburgh: National Gallery of Scotland, 1992), p. 175. Walsh, John. 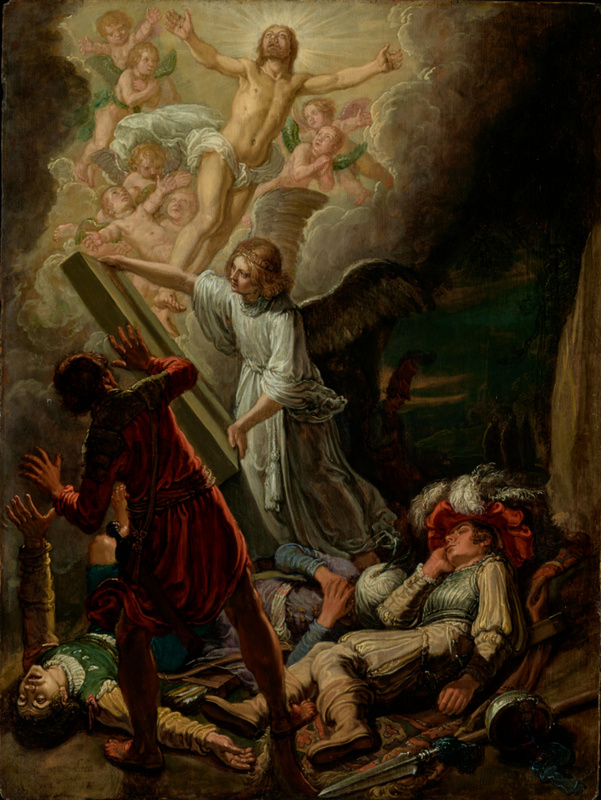 "A 'Resurrection' of 1612 by Pieter Lastman." In Shop Talk: Studies in Honor of Seymour Slive. Cynthia P. Schneider et al., eds. (Cambridge: Harvard University Art Museums, 1995), pp. 254-56, 419-20, fig. 2. Jaffé, David. Summary Catalogue of European Paintings in the J. Paul Getty Museum (Los Angeles: J. Paul Getty Museum, 1997), p. 71, ill.
Seifert, Christian Tico. Pieter Lastman: Studien zu Leben und Werk, mit einem kritischen Verzeichnis der Werke mit Themen aus der antiken Mythologie und Historie (Petersberg: Michael Imhof Verlag, 2011), pp. 149, 153, 160, 213, 254n611, 263n1036, 270n1279, fig. 147. Zeder, Olivier. "Après Utrecht: Rembrandt et la peinture d'histoire en Hollande." In Corps et ombres: Caravage et le caravagisme européen, exh. cat. Michel Hilaire and Axel Hémery, eds. (Montpellier: Musée Fabre, 2012), pp. 404-5, fig. 2.